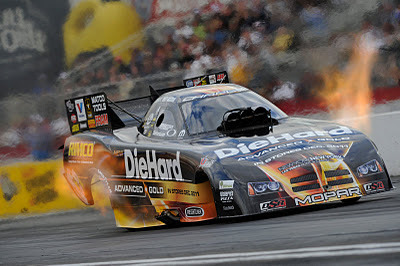 POMONA CALIFORNIA/AVONDALE, ARIZONA - It was a Burns Stainless final round with customers Greg Stanfield and Kurt Johnson pairing off to see who won the NHRA World Finals. The two Pontiac GXPs looked great side-by-side on at the starting line. Unfortunately for the fans, Kurt’s car broke at the starting line (no, not the collectors!) Stanfield didn’t hold back posting a 6.597 s with a 209.59 mph run. 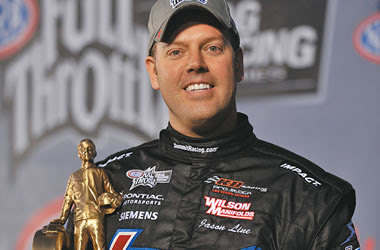 It is interesting to note that all of Greg’s runs on Sunday were easy wins with Allen Johnson going sideways at the 1000 ft lights and Jason Line, the 2011 Champion, having to lift at the 1/8th mile when he got loose. “Any time that you win the last race of the season, it makes the winter time a lot better,” Stanfield said. “We’ve been a bit behind in this game for a while, we’re a little bit off, the car has got a lot of runs, and we’ll be hoping to get a new car for next year." As SPRINT CUP moves into the final race, Carl Edwards and Tony Stewart both put in great performances at Phoenix and are separated by the same 3 points in the Chase as before the race. 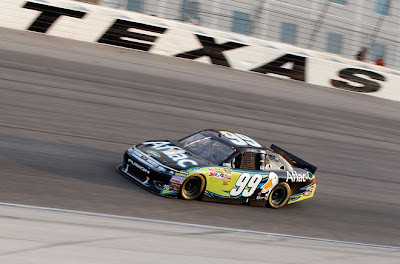 Though Stewart dominated most of the race, Kasey Kahne was able to claim the lead on lap 299 following a series of green-flag pit stops and kept Edwards at bay to the finish. This was Kahne’s 12th Sprint Cup win and the first this season. Edwards finished second by a mere 0.802 seconds, followed by Sewart. Jeff Burton finished third with Ryan Newman fifth. It was fitting that Kahne claimed a win for the Red Bull team that has announced it will not be continuing in NASCAR. Kahne has signed with the Hendrick’s organization as Jimmie Johnson’s teammate. 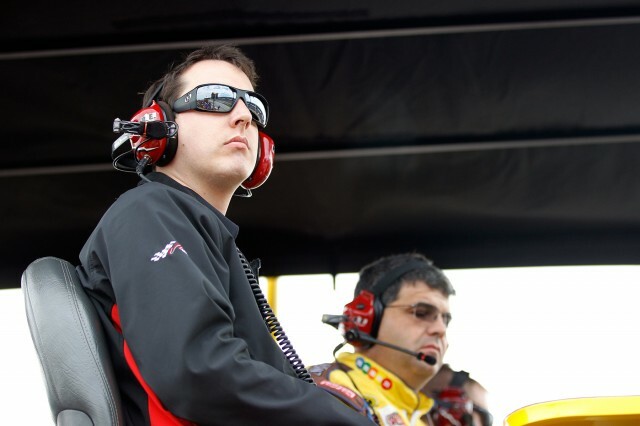 The drama was still high in the Gibb’s garage following last week’s suspension of Kyle Busch after the truck incident involving Ron Hornaday. 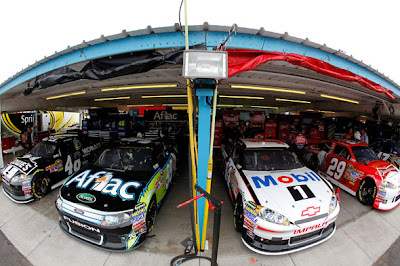 The trouble began when Busch, who qualified 34th, noted that he had no oil pressure for Sunday morning practice. After a quick diagnosis by the pit crew, the engine was replaced sending Busch to the back of the pack but was able to move up running as high as third. But, to add insult to injury, Busch retired on lap 187 with “catastrophic engine failure.” "It's terrible to have one [engine failure] in a weekend, let alone two," Busch said. "It's times like these where you feel like you're down in the dumps, and all you can do is try to pull together and move on through it... It's been a tough couple of weeks and all we can do is go to Homestead, ... win a race in the final outing and get some positive momentum into 2012." 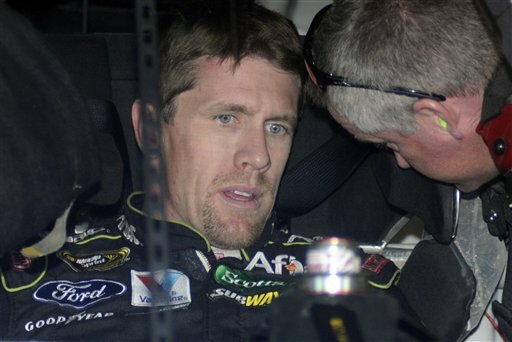 So, will Carl Edwards hold Tony Stewart off at Homestead and bring home the Cup? Tune in and see! 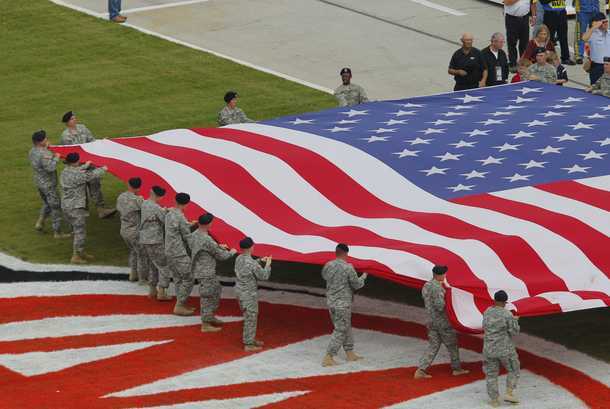 DALLAS, TEXAS – It was an exciting weekend at the Texas Motor Speedway. Tony Stewart made an impressive showing winning the race and coming within three points of Chase leader Carl Edwards. 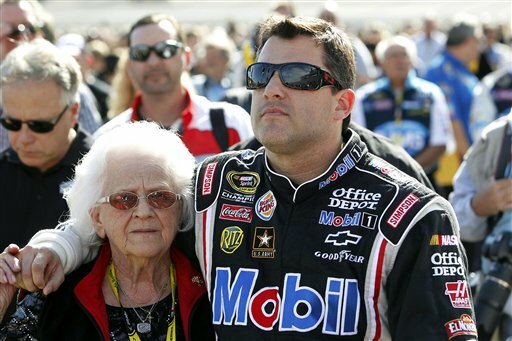 "I don't think we have to say anything," Stewart said in Victory Lane. "I think our performance spoke for itself. He knows we're there -- trust me - Carl kept us honest. We got all the bonus points we could get and we got the win, so we gained more than we needed to gain on the average for the week. Stewart led much of the race, but Edwards got the jump on a restart on lap 267. Stewart wrestled the lead back from Edwards on lap 275, but after a series of pit stops, fell back. On lap 334, he regained the lead when Jeff Burton ran out of gas with 4-laps to go. Edwards kept up the pressure to the end, but had to settle for second place. "Although we would have loved to have won [Sunday], to be three points ahead, and then to have the third- and fourth-place guys farther behind, it looks like it's truly going to come down to Tony and I, and that's going to be a lot of fun," Edwards said. Kasey Kahne finished up in third place followed by Matt Kenseth. Greg Biffle finished in the top-five. Jeff Gordon ended up in sixth – good enough to move him up 2 points in the Chase. 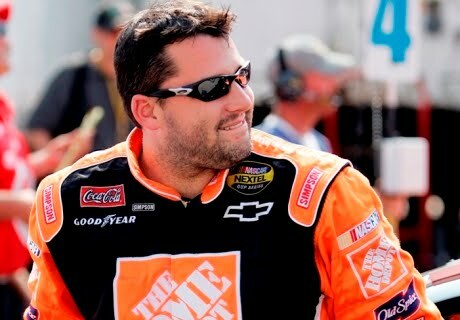 Tony Stewart has won four of the eight races in the Chase for the Sprint Cup. None of the other drivers in this year’s Chase has won more than one. While Edwards has been extremely consistent this year, he has not won a Chase race yet. In fact, he has only won one race this year – Las Vegas in March. With two races remaining in the season, Edwards has a three-point lead over Stewart in pursuit of the series championship. This season, Edwards’ has consistently finished well. He has 17 top fives to Stewart’s seven and 24 top 10s to Stewart’s 17. So the question is, does consistency win Championships? We’ll find out in the next couple of weeks. The other story of the weekend was Kyle Busch’s antics in Saturday’s truck race when he decided to take out Ron Hornaday after some contact on lap 15. Hornaday and Busch were racing side-by-side when they came up on Johnny Chapman. As Hornaday, a championship contender, moved up the track to avoid Chapman, he got loose and made contact with Busch, sending them both into the wall. 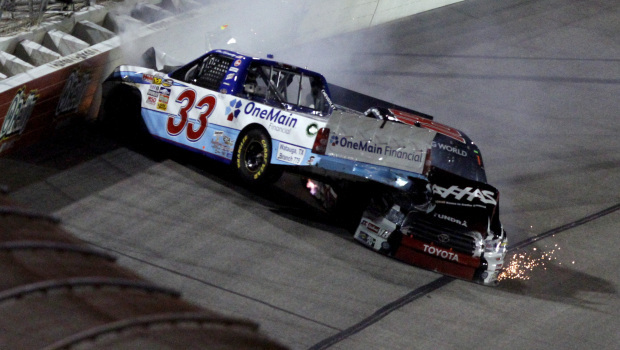 Both trucks made minimal contact with the wall and continued on before the caution flag was raised. Busch caught Hornaday and rammed into the rear of his truck, then made a move to the right then left spearing Hornaday in the left rear quarter resulting in both cars hitting the wall. Busch was sent to the garage by NASCAR officials and was ultimately fined $50,000 and made to sit out of Sunday’s Cup race. 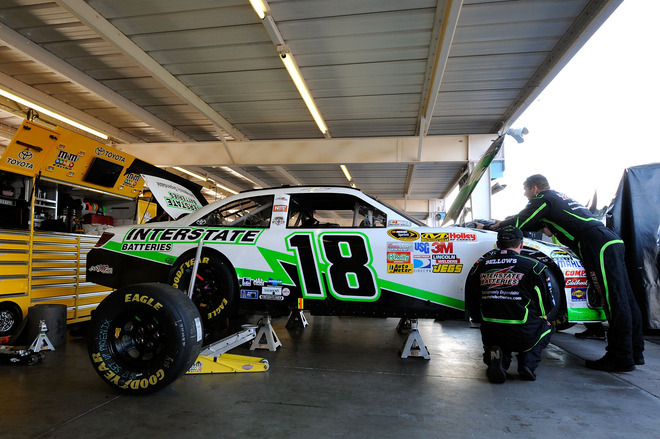 This was a costly action by Busch as he was in 7th place in the chase. 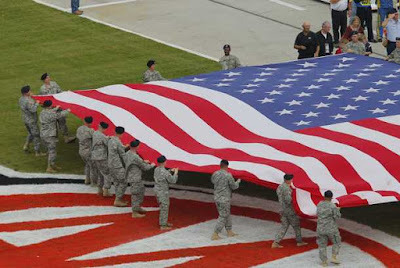 In a post-race interview, Darrell Waltrip commented that, if anyone can, “ Joe Gibbs can teach Kyle Busch respect for the other drivers.” He added that “art of greatness is respect.” We can all learn a bit from that nugget of truth.